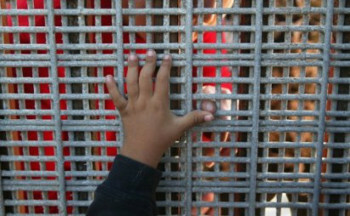 This past summer, when it was announced that upwards to fifty to sixty thousand unaccompanied children and teens, mainly from Central America, had been apprehended at our southern borders and had overflowed the existing detention centers, huge logistical, moral and ethical questions arose. Should we keep them? Should we send them back? And how would we logistically (and faithfully) do either one? Responding to this, Kelly Gallagher, our MACUCC Associate Conference Minister for Justice & Witness programs, called together people from all over the conference to share ideas on resources for education advocacy and worship on the issue. Many local parishes and associations hosted education forums and hands-on training events on how to understand and how (or whether) to minister to, and advocate for, the migrant children. One of those forums was organized by South East Area Missions (previously the “Pilgrim Association Mission and Community Concerns Committee”) and hosted by the First Congregational Church of Wareham (UCC), Saturday, September 27. They had five speakers. One was Sr. Rose Marie Cummins, who spent many years in the Federal Detention Center in Florence, Arizona, and she shared gripping stories of conditions in the centers. Another was Jena Gutierrez, a staff attorney at the Immigration Legal Assistance Program of Ascentria Care Alliance (formally Lutheran Social Services), who spoke of the legal hurdles of people trying to attain legal status in this country, and offered suggestions on how churches can get involved. We were also fortunate to have Francisco Jacobi, from the Mexican Consulate, and Ana Alonzo, from the Salvadoran Consulate join us and answer questions about how their offices helped immigrants when they get into this country. A very special guest was Karla Villatoro, a young woman who was brought to the U.S. from El Salvador, when she was five years old. Her father and mother fled first after her father was beaten and tortured for protesting the authoritarian government in the 1980s. Then, two years later they paid a “Coyote” to take Karla and her sister on a terrifying journey in trucks and boats and trains and running on foot in fields while being fired upon, to get them into this country. Today Karla, once one of the “Dreamers,” is a citizen, a member of the First Congregational Church, a building contractor, Fire Department official, and U.S. Marine. Her powerful story put a very human face on the facts and statistics of the day. The forum was a success and could serve as a model for others in other regions who wish to help their churches and neighbors understand more deeply the many layers of complexity in this very difficult issue. For information on sponsoring a similar event, or to contact any of our speakers, write to standuncan@post.harvard.edu. For more information on the newly formed Immigration and Refugee Concerns Task Force, click here.